What are Lead Magnets? How do I use them? A lead magnet is an incentive that marketers offer to potential buyers in exchange for their email address, or other contact information. Lead magnets usually offer a piece of digital, downloadable content, such as a free PDF, a checklist, report, eBook, whitepaper, video, etc. Here are 6 examples of really-good lead magnets you can create to give away and start building an online business. The more exciting your offer sounds, the more people will gladly give up their email addresses to receive it and you can begin building an online business. This Lead Magnet can be a list of tips that will help people solve a problem that they are seeking a solution to. Owner Needs To Know About”. If you were a small business looking for help with taxes, then you better believe that would capture your attention, and get you to give up your email address! In this report, you can share the top 8 tax savings tips, and even do a paragraph or page at the beginning and end that sends people to your website for more information. If you are an affiliate marketer with content sites selling people on mattresses, then you could do a report called: “How To Find The Perfect Mattress For You”. Then you create a short 3 to 5 page report explaining your tips for finding the perfect mattress. That would be attractive on your site, and would generate those email subscribers that you can then follow up with later when you have sales on your store, and inside the report you can could of course recommend 6 products from your store with direct links! Another example for this type of lead magnet is found here in this chapter! I could simply take the 6 lead magnets I am recommending right now, and do a free report called: “6 Highly Effective Lead Magnets”. If you are stuck for ideas about what your market wants look at Q&A sites like http://answers.yahoo.com or www.quora.com. You can also do a search for your niche keyword phrase like “pet products”, “small business taxes”, or “mattresses” into www.youtube.com or www.google.com and look at the ‘Suggested Search Phrases’ that come up! Browse forums in your market or even look at top selling books within your niche on Amazon. Just think creatively and start writing. It is conceivable to write your entire lead magnet in just a few hours from start to finish! 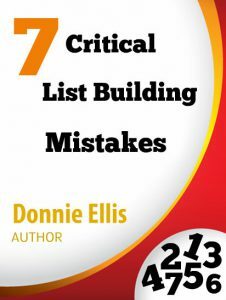 Grab a copy of the 7 Critical List Building Mistakes. Like the top tips report you can record a video that teaches people something important to them! Do not let the idea of video scare you. This video can be as simple as a PowerPoint slide where you record your voice giving the content on the slides. You can use a simple screen capture software to record it. These types of videos are simple to do. You can knock these videos out fast as well. Here are 3 different screen capture recording software programs. 1) Screencast-O-Matic – This is a free screen capture software with a $15/annual upgrade (at the time of writing this ebook). The annual upgrade option removes the watermark on the videos. A very low cost in my opinion. 2) Jing – This is a free software that also allows you to record videos, and has a low upgrade to make it easier to work with the video files. 3) Camtasia – This is a more expensive web-based software, but honestly worth a serious look if you plan to do lots of videos in the future as it has a simple to use editor that can be used for all kinds of videos not involving your screen captures. Start with one of the free or low-cost options to get your feet wet at making videos first. 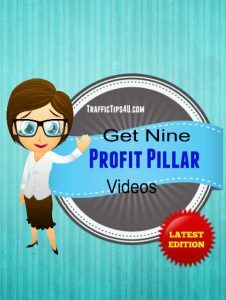 Would you like a free copy of the 9 Profit Pillar Video series. Another simple way to make a video or a series of videos to give away is to use your cell phone! Yes, even a selfie video when hold still well do great for you! You can make a great video in 10 minutes or less! Just make a list either on paper or in your head on what you want to cover and start recording! Video is not hard! The hardest part of video making is just getting started. Once you get your feet wet in the video creation process, you can even start making videos to promote your landing page. A popular giveaway method is to offer e-coaching or email training! This is a great strategy to get people in the habit of opening your emails consistently. So instead of offering your giveaway in the form of a single PDF or a video, you could offer a series of 5 to 10 emails that deliver the content daily, every other day, or weekly! Another benefit to this strategy is that it means you can launch your list building efforts with the first email! Then of course add the others and once your e-coaching lessons are all wrapped up you don’t have to do it again unless you decide to update them. All these can be delivered automatically through your autoresponder. Again, just find hot topics to create content around, and use that for your list magnet! The key is finding content your audience really wants to know, and making it easy for them to get it. Interviewing an expert in your industry is another unique way to quickly create a lead magnet. This means researching to find a popular author, speaker, blogger, radio show host, or other expert in your marketplace. You can ask them to do a 15 to 30 minute interview with you that you record electronically. Simply come up with the top questions to ask, and join each other on Skype or Google Hangouts! Then you deliver the interview as an audio file to your audience after they opt-in for your email list! Hosting a live webinar even in your market is a great way to start building a list. You can use your Webinar as an ongoing lead magnet. Simply choose a date for your special webinar event and drive traffic to your registration page. You can use Google Hangouts (free) or GoToWebinar to host the webinar. Webinars also double as a powerful sales tool. You can sell your products or services easily at the end of them. Sometimes even affiliates for you will help send you traffic. Like with the other lead magnets your key is to choose a topic that you know your audience wants more details on! This is probably the easiest to create lead magnet by far! You can create a unique coupon code that you can offer people that opt in to your email list! It is a great solution because it solves two problems. 1) What are you going to giveaway? 2) Give your customers an immediate reason to buy from you! The simplest way is to create a generic coupon code and offer it to your customers to download. You could also give them access to a special discount page to access your products in the future!